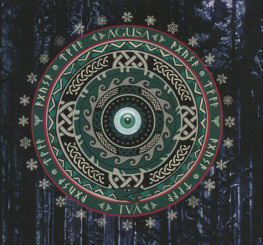 An interesting little curiosity this: the second album from Sweden’s Agusa features just two instrumental tracks – although perhaps ‘movements’ might be a better term – beautifully performed by the band which features founder members Tobias Petterson (bass) and Mikael Ödesjö (guitar) alongside organist Jonas Berge and drummer Tim Wallander and recently recruited flautist Jenny Puertas. Forgive the obscure reference, but opener ‘Gånglåt Från Vintergatan’ builds powerfully for the first eight or so minutes in a similar way to Jon Lord’s ‘Bourée’ from his 1976 ‘Sarabande’ album, surfing on a beautiful keyboard wave. It’s sublime and ethereal, slowly working up to revealing its full glory, after which it takes off on a largely organ-driven flight of fancy before Ödesjö steps up the plate and lets himself go. It’s very Seventies – it’s as progressive rock as progressive rock gets – and all the more glorious for it, winding down like a spring after twenty minutes during which it keeps its listeners’ attention throughout. ‘Kung Bores Dans’ – by a couple of minutes the shorter cut on the album – evokes at times a feeling not unlike the more otherworldly parts of Scorpions’ ‘Fly To The Rainbow’ (check out the bridge around the four-minute mark and you’ll see what I mean). Flute and organ take centre-stage as proceedings unfurl, but again, like ‘Gånglåt Från Vintergatan’, the song refuses to be hurried – or pigeon-holed – and when it does gear up at about the fifteen-minute mark for its final couple of minutes (plus coda), again with that man Ödesjö at the helm, the immense shift in gear it does take you by surprise.